Boggs lifted the twin bed’s mattress and found what he was looking for duct taped under the bedsprings – the most wanted gun in England. It had been less than a week since Boggs and Gibson brazenly robbed the east Oxford Betfred midday with nylon stockings over their heads. All had gone to plan until Gibson inexplicably unloaded one of the shotgun’s barrels into the torso of the frightened west-Indies clerk. Shortly thereafter, the tabloids got hold of the story and raised the usual alarms: criminal culture, racial violence, the need for more punitive sentencing. But what explanation was there? Something about no loose ends, Gibson had said with a grin immediately after pulling the trigger. Truth be told, Boggs had stopped trying to understand Gibson years ago. They were wanted for robbery and murder now and the police couldn’t be far behind, but Gibson had chosen to hole up in a rundown bedsit in south London that had taken Boggs less than three days to locate. It was wasted time. He should have been in Corsica by now, but Gibson had stiffed him on his share from Betfred after they fled separately and he needed the money to get out of England. That and Gibson was not going to get in the way any longer. Gripping his pocketknife with his short, but muscular, gloved hand, Boggs cut free the double-barrelled Lupara while cursing under his breath about Gibson’s sloppiness. Once freed, he broke open the gun’s action and found the spent cartridge from the robbery still in the right barrel and a live cartridge in the left. Boggs replaced the mattress and sat on it. Stained, dirty, and without a bed sheet, the thin mattress’s springs dug into Boggs’s posterior. But the bed was in front of the door and he would be the first thing Gibson saw when he entered. Boggs cocked the hammer on the Lupara’s left chamber and wrapped it in the bed’s pillow, which also lacked a pillow case. It wasn’t a perfect situation, but the pillow would muzzle the gun blast and give Boggs precious extra minutes before any of Gibson’s addict neighbours inspected what had happened. Boggs removed his e-cigarette from his red hoodie’s front right pocket and inhaled deeply. Surveying his surroundings, there was not much in the windowless, oblong room. A sink and some cupboards a few feet to Bogg’s right, a toilet in the room’s far corner, and the bed. The bed directly in front of the door where Boggs waited. And after four drags from his e-cigarette Boggs heard Gibson’s footsteps on the stairs; always light, but firm, he recognized them anywhere. Gibson entered carrying an orange Sainsbury’s shopping bag in each hand, but did not so much as flinch at the sight of the pillow-ensconced sawed-off shotgun pointed at him. Alright Boggsy? was all he said and moved to the kitchen where he set the bags next to the sink before turning to face his former partner. Gibbo, came the curt acknowledgement. I suppose you’re wanting your money. I tucked it into the mattress, Gibson casually confessed. If you look down you’ll see the stitching, just under where you’re sitting. Boggs quickly glanced down, while keeping the gun trained on Gibson. He saw the stitching easy enough and felt a pinch of embarrassment at not having noticed it earlier. Gigs up, Gibbo, Boggs said upon looking up, to which Gibson merely shrugged. Boggs pulled the trigger. Bluish smoke filled the room’s air which stank of sulphur and burnt metal. Gibson removed bath towels and a kitchen knife from the grocery bags and rolled Boggs’s bloody body off the bed. His skin peppered with buckshot and splintered steel, it hung in shreds as he groaned quietly on the floor. Never checked that barrel if I plugged it, did you? Gibson smirked. Schoolboy error. Gibson spread the towels over Boggs and then cut into the mattress and removed four, three-inch-thick stacks of notes and placed them into the Sainsbury’s bags. He stepped over his former partner and walked out the door, leaving behind the twitching body that doggedly, but futilely, clung to life. 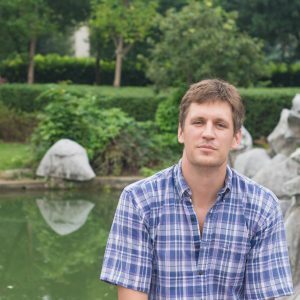 Peter Anderson lives in Ningbo, China where he teaches economics. Originally from the Midwest in the United States, he enjoys writing fiction in his free time.